Hassan Rouhani condemns 'massacre' in Gaza Monday - despite the fact that Tehran provides Hamas with the rockets causing the conflict. Iran's President Hassan Rouhani denounced Monday the "inaction" of the UN Security Council on Gaza, describing the conflict as a "genocidal massacre" of Palestinians by Israel, according to AFP. His comments came at a meeting of the Non-Aligned Movement's (NAM) committee for Palestine, with several foreign ministers among officials from Qatar, Kuwait, Oman, Venezuela, Bangladesh, Sudan, Uganda and other member states. 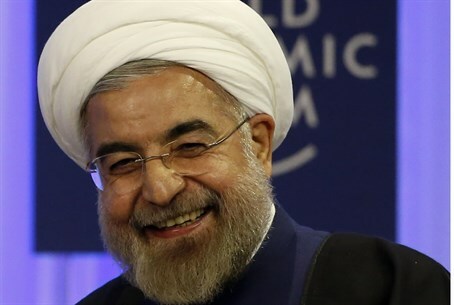 "The savage aggression by the army of this child-killer regime (Israel), continues with a deliberate policy to commit genocide and massacre civilians and destroy infrastructure, houses, hospitals, schools and mosques," Rouhani said in Tehran. "The inaction of international bodies, in particular the Security Council, to prevent the crimes against humanity of the Zionist regime" is to be condemned, he added. Iran does not recognize Israel's existence and supports terrorist groups that fight it, including Hamas. Ahead of a temporary unilateral truce, Israel early Monday launched further strikes on Gaza, killing at least 16 people, including an Islamic Jihad commander Danyal Mansour. The four weeks of violence have also killed 64 Israeli soldiers and three civilians, who were hit by rocket fire. Iran has provided Hamas and Islamic Jihad with long-range missiles such as the Fajr-5 and M302 - the latter of which is believed to have been used in the attack on Hadera in north-central Israel last month. Despite its active role in providing the rockets raining down on Israeli population centers, Iran condemned the IDF operation aiming to stop the rockets as "savage aggression" in July.